CarGurus has 50,672 nationwide F-250 Super Duty listings starting at $1,995. In traditional fashion, Ford keeps the pedal to the metal trying to maintain the status quo in full-size pickup supremacy via the monster-sized 2015 F-250 Super Duty truck lineup. With the addition of some significant power to the available 6.7-liter turbodiesel V8 engine, as well as some allegedly hefty styling tweaks in the high-end King Ranch trim level, this bullish three-quarter-ton pickup remains a capable construction-site carryall. Details thus far continue to be sketchy, but Ford claims a significant increase in towing capacity from the blown diesel V8 for this model year, while a new “Running W” graphic scheme and a couple of additional exterior colors along with a pair of 2-tone fabric choices are among the scheduled updates to the Texas-themed King Ranch variant. Other than that, this latest heavy-duty workhorse is expected to retain the 3-seat Regular Cab configuration, the 6-place Super Cab version (again with rear-opening back doors), and the 6-passenger Crew Cab with its 4 independently opening doors. Bed lengths are also slated to stand pat at the 6.8-foot standard bed and the 8.2-foot long bed. Both bed lengths should again be available to Super Cab and Crew Cab variations, while the Regular Cab variants return offering only the long bed. Also expected to return for 2015 are the 5 traditional trim levels; the base XL, the up-featured XLT, the midlevel Lariat, the posh (and new-look) King Ranch and the flagship Platinum. Lower trims are available in all cab and bed-length choices, while the Lariat comes only in Super Cab and Crew Cab garb, and the re-designed King Ranch and the Platinum trim levels remain available solely in the Crew Cab configuration. No changes are slated for the Flex Fuel 6.2-liter V8 powerplant that once again comes standard in each of the F-250 Super Duty pickup trims. Thus, look for 385 hp and 405 lb-ft of torque to remain under the management of a well-wrought 6-speed shiftable automatic transmission, while towing is again expected to be maxed out at 12,500 pounds with the standard 3.73 axle ratio. Also, look for higher trims to retain eligibility for a 4.3 rear axle ratio capable of hefting up to 14,000 pounds of trailer. Oh, and the 6-speed automatic now boasts a brand-new torque converter. The optional and up-powered 6.7-liter turbodiesel V8, meantime, is touted by the folks at Ford as sporting a larger, single-vane turbocharger, improved fuel injection and an upgraded cooling system that should allow this beast to tow significantly more than last year’s 14,000 pounds. Whether or not this tweaked grunter can beat GM’s expected 17,900 pounds of trailer-toting capacity or Ram’s touted 17,950 pounds (each in their respective 2500 iterations) remains to be seen. Anyhow, the 2015 F-250 Super Duty’s payload is expected once more to max out at 4,240 pounds, depending on the selected wheelbase, cab style and bed length. Wheelbases, by the way, should again run from 137 inches to 172.4 inches, depending on the particular configuration selected. Of course, a rear-wheel drivetrain (RWD) is again slated to be standard for this big rig, with an optional part-time 4-wheel drive (4WD) system boasting a 2-speed transfer case and locking rear differential once more awaiting those off-road adventurers. Traditional appearance features should remain dependant on the trim level desired and ought to include 17-inch, 18-inch or 20-inch wheels, a Class IV trailer hitch and wiring, side steps, heated power-adjustable mirrors and a power-sliding rear window. Look for creature comforts to run the gamut from vinyl to leather upholstery, with higher trim levels offering such standard amenities as heated power-adjustable front seats, full power accessories, leather and simulated wood cabin accents, dual-zone climate control, power-adjustable pedals, and, in the case of the Platinum, a heated steering wheel. Remote engine start also graces the higher trim levels, with the XLT and above also packing standard cruise control. Telescoping tilt-wheel steering, meanwhile, adorns all trim levels, while a rear-view camera, rear parking sensors and an auto-dimming rear-view mirror are slated to return in the Lariat and above trim levels. Standard techno-goodies expected to return for 2015 include Sync infotainment with MyFordTouch displays and Bluetooth-integrated communications in the XLT and higher trim levels, along with a standard memory-card-based navigation system in the King Ranch and Platinum editions. Finally, audio components progress from a 2-speaker AM/FM radio setup in the XL to a Sony premium system boasting up to 9 speakers, as well as a single-CD player, satellite radio and a video display that’s loaded into the top-shelf Platinum. Bearing in mind that Ford is so far noncommittal regarding any changes to options and packages for this coming model year, look for the 2015 F-250 Super Duty lineup’s optional equipment list to remain heavily trim-dependent, with lower trims eligible to be optimized with many of the upper-echelon gizmos and décor items that come standard in higher trims. Additionally, look for the heavy-duty front suspension package to remain available to all trims, along with a spray-in bed liner, and Ford’s Work Solutions and Crew Chief telematics. Upgraded wheels, and a power moonroof, meanwhile, should also return as options in the Lariat and above trim levels. Standard safety equipment for the 2015 version of the F-250 Super Duty stable, finally, should remain 4-wheel antilock brakes (ABS), traction and stability control, front side-mounted airbags and front (and in 6-seat cabs, rear) head airbags. Ford’s programmable MyKey system that restricts speed and audio settings is again a teen-targeted standard safety feature lineup-wide, as is a post-collision safety system. In addition, expect the latest F-250 Super Duty XLT and higher trim levels to retain Sync emergency assistance and alerts, with the Lariat and above trim levels packing standard turn-signal-integrated mirrors and a remote antitheft alarm. Meantime, the King Ranch and Platinum versions are expected to return bearing standard front fog/driving lights, as well. 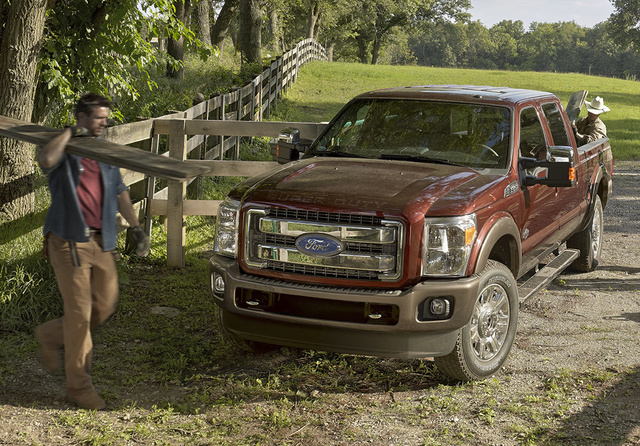 What's your take on the 2015 Ford F-250 Super Duty? Displaying 1 - 10 reviews out of 22. TOYHAULER Has your mileage improved at all since your last post? I am considering a 2015 vs 2014 F250 given the increased power and torque (not needed for my current towing needs). However, I am very concerned about doing so if what you say is accurate. You are the ONLY post I have found speaking about fuel economy for the 2015 under normal driving conditions. I have asked several dealers and they have not heard this complaint from their buyers (so they say.....). Any feedback would be appreciated as I will definitely get the 2014 if the mileage difference is as significant as you state. MHG I purchased my 2015 F250 King Ranch two weeks ago. I too am concerned about the gas mileage. I am not towing or hauling anything in the truck and I am averaging 9MPG. Very disturbing and this certainly was not disclosed on the paperwork. At this rate, I will have to trade my truck quickly, take a significant loss just so I can afford to drive. Luis I'm going through the same. I just bought my 2015 F250 Platinum and gas mileage is crazy. Although ive never had a diesel truck before, I certainly did not expect the gas mileage to be this bad. The best it has shown on the display is 14.2 mpg and that's babying it without towing.... Is there anything we can do to help out with the mpg? tuckF150 If it makes anyone feel better, I have a 2014 F150 Platinum with the 6 cylinder Eco boost and I'm getting 15.2 MPG. I've written Ford and had the vehicle inspected at a dealership. They say that is within the acceptable standard. While towing.... forget it..... The vehicle pulls itself into every gas station. Towing a 26' SUPER LIGHT travel trailer, I get about 7 MPG. I'm looking at F250, or GMC Sierra's now. dscobb I'm looking at getting the 2015 F250 4x4 6.2 V8 gas for work. I had a 2012 Diesel F250 that averaged 12 to 13 mpg in the city and 15 to 16 on the highway. With the price of diesel compared to gas I'm looking to take the risk. Does anyone know the gas mileage of a 2014 or 2015 F250 4x4? Marty My 2015 F250 diesel has very poor fuel mileage compared to my 2011 F250 diesel that I traded in. Both trucks spec'd about the same, and fuel mileage on 2015 is 13-14mpg vs. 2011 17-18mpg. These figures are mostly highway pulling nothing. VERY DISSAPOINTED WITH 2015's POOR FUEL ENCONOMY. fuckford don't buy ford !! !i have 2014 f250 6.2 gas poor fuel economy AND last week motor blew dealer said valve seized and piston hit it +sent debris throughout. total loss w/ 8,800 babied miles on engine.. replaced with remaned this week now how much is it worth now? never a ford again!!! Displaying 11 - 20 reviews out of 22. TookAChanceOnFord I also purchased a 2015 in July 2014. To date only getting 12 around town, 14 on the freeway, and 7ish pulling a 7500 pound camper trailer. Love the power and everything else but very disappointed. My 2007 1/2 ton GMC got better mileage pulling my 5000 pound boat. I bought a diesel cause it is suppose to not have as large of a change in mileage when towing. Not the 2015 Ford pulling half its rated towing capacity yields half the mileage! Unbelievable! bill25802 Bought 2015 F250 diesel in Feb this year. Has 3:31 gears and P275/75/18 tires. On a 300 mile trip I average 18.6. After I get a few miles on it I expect to get in low 20's. fb125ck Fb125ck, Very disappointed owner! I traded in a 2012 F 350 for a 2015 F 350. I drive the same 60 mile one way drive everyday to and from work. I was getting between 18.7 to 19,1 mpg over a three year period. now I am getting 14.0 to 14.5 for the same drive. I would gladly take my old truck back! The towing millage also dropped 2.5 mpg. jlpool We have the same problem. Had a 2012 F250 that got 18 mpg on the highway and 10.5-11.5 towing. Our 2015 gets about 14mpg on the hwy and 6.5-9.5 towing. Love everything about the truck except the mpg. Dealership has told us this is uncommon nobody has this problem. Apparently they are wrong. Makes us want to trade for something else! 57fishman I think most of you with the bad fuel mileage must have your foot into too much. I just purchased a 2015 2 weeks ago. Was putting on some miles before I towed. Drove on some 2 lands and highway and when I got back home the mpg read 18.8. Not too shabby. I couldn't get over 15.3 with my 2014 F150 ecoboost. I'm very pleased. bigskyr I purchased last year a 2015 King Ranch 250 and GET TERRIBLE GAS MILEAGE !! 9 mil, 11 on HWY. THERE IS NO SECRET ABOUT THIS..NOW. THE DEALERSHIPS ARE KEEPING QUIET ABOUT THIS.. TERRIBLE, worst truck I have owned. Jeanette I bought my 2015 f-250 4x4 diesel super duty, super cab, 8 ft bed a year ago and I love it!! I can't ask for better mpg in a truck. 30,000 miles now and about 1/2 of that was towing a 25 ft horse trailer all over the state. this truck gets 17 mpg in town and 15 mpg towing over mountain passes. I LOVE THIS TRUCK!! best decision i've ever made. nothing but great things to say about it. Fordsman I can tell you about the crazy 15.5 MPG in my F250 diesel 4X4, one day I noticed a bad squeak in the front wheel , went to Ford House and was told my front hubs were locked in 4x4 mode, I said what I never touched that just pushed button on dash. Well guess what they unlocked them and now after 50K miles on my 2015 the MPG has went to 18.5-19, I know this sounds crazy but half the people I talk to say theu are getting 15.5 others 18-19, I found out how. Displaying 21 - 22 reviews out of 22. OVGC 2015 F-250 6.7 Diesel What a disappointment to say the least. I had no ideal the MPG would be this bad. I should have done my research before buying this truck. 10 to 11 around town and on the highway doing 75 I am lucky to 13 without pulling a trailer. Guru9MTBW I've had my 2015 f250 gas engine for 2 years engine light comes on towing in the mountains, dealer looks up vin and says I can't use E85 gas even tho I have yellow gas cap with e 85 on it and flex fuel sticker on tailgate, now what? Users ranked 2015 Ford F-250 Super Duty against other cars which they drove/owned. Each ranking was based on 9 categories. Here is the summary of top rankings. 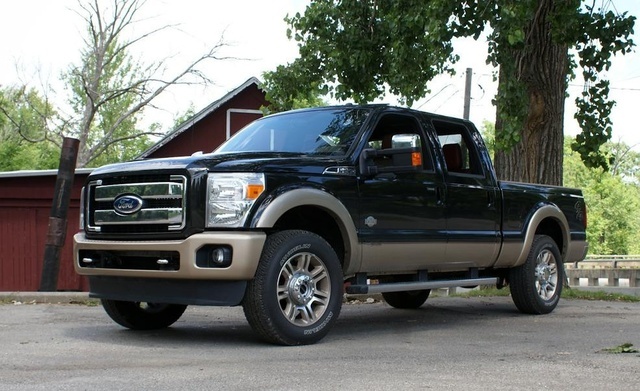 Have you driven a 2015 Ford F-250 Super Duty? How can I add the rest of my pictures to my posting? Can you put the grill and headlights out of a 2017 F-250 and put in a 2015 F-250?